Working with Agape Volunteers puts you in control of how much you earn. More volunteers equals more pay! Want a meaningful and flexible job? We're currently hiring University Representatives to add to our dynamic team. Your role will be to encourage interest in Agape Volunteers at your University, and you'll be paid for every successful sign-up. This job requires strong motivational and interpersonal skills but is also highly flexible, allowing you to help a good cause whilst earning some cash. Thanks to our competitive prices and appealing packages, we've placed nearly 2000 volunteers in Africa for meaningful, life-changing experiences. We have representatives at 15 different universities across the UK and this is growing. Our Reps help inform students about our incredible volunteering opportunities! The loyalty and effort to our volunteers show with our 5- star rating on Volunteer Forever. We will help with everything we can to ensure you get the best experience. We understand what it's like to be a cash-strapped student who wants to earn some money whilst sticking to their principles. If you want to find out more, please register your interest using the form below. Being a University Rep allows you a flexible way to earn a little money to fund your summer. We keep it really simple - for every volunteer you send our way, you receive a £30 commission. But it doesn't stop there! 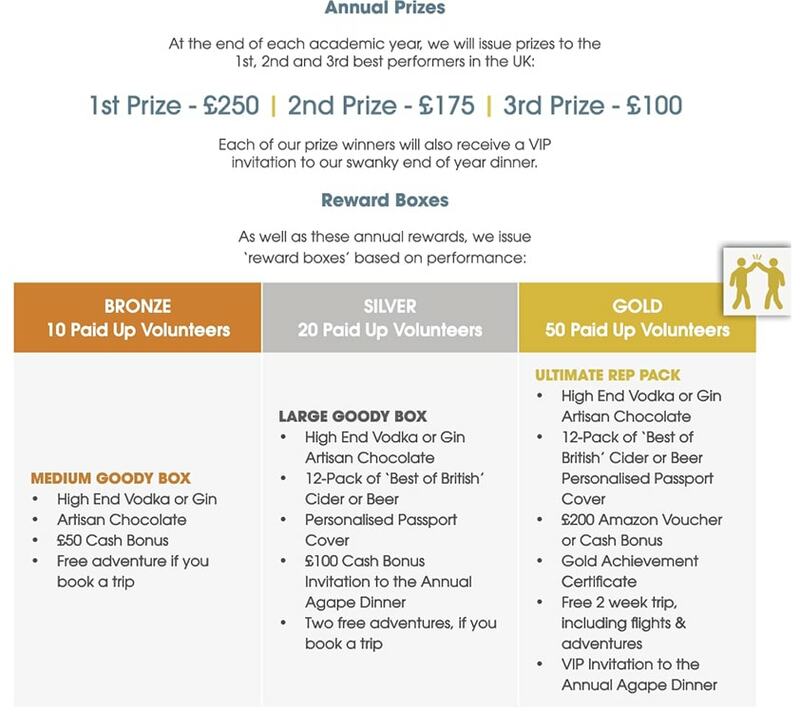 There are loads of other perks to being a Rep with us and helping to send valuable volunteers abroad.
" I had the best experience ever in Kenya! The volunteer leaders are amazing, very helpful and friendly. A great way to spend your summer! " " Had a fantastic experience with Agape volunteers! All of the volunteer leaders were very helpful and friendly. Had a great time and learnt a lot whilst volunteering. The excursions were an added bonus! Would highly recommend to anyone! " " I met some awesome people on my trip from all around the world and was warmly welcomed by the Kenyan people. I would recommend Agape to anyone as they were very organised and professional but fun and enthusiastic at the same time. "